Pictured: Patrick, Josh, Chris and Andy with Adina. The beer mile in Bermondsey is legendary. The second brewery to arrive there was Partizan Brewing, somewhat tucked away on a small street and behind a rather divey pub. 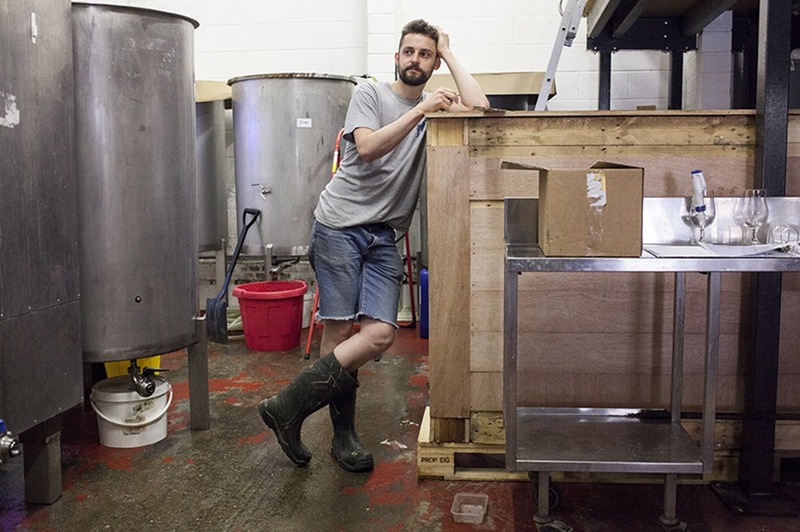 The location is surprisingly small, and as Andy Smith, founder and brewer of Partizan explains, will soon be even more crammed with equipment. A week before the London Craft Beer Festival Andy took a moment to talk to us about all things Partizan. Die Deutsche Version des Interviews ist hier. Which of your beers would you have served beer hunter Michael Jackson? I probably would have liked to sit Michael Jackson down and take him through all the beers we are brewing. If I was allowed just one, then maybe the Barley Wine. It’s probably the one we’ve all been most proud of. It is a classic old school English recipe, using a classic old English yeast strain. But as said, if Michael Jackson was around at the brewery, I would want to stay him there forever and make him drink every one of our beers we’ve ever made. Interesting. Usually people go for something with low ABV. It was kind of a toss-up between the Barley Wine and one of the Saisons which we get a lot of good feedback on. The Barley Wine was just kind of a one-of beer which makes it more special. Obviously meeting someone like Michael Jackson you want to bring the big game. But yeah, maybe he would be more impressed by the lower strength beer. That’s kind of why I want him to try everything. Actually anybody that visits the brewery, I want them to try everything. And hopefully they can find what they like. For preparation I read an interview with you in The Evening Brews, one of our favourite blogs. It was done in 2013. What has happened with Partizan since that interview was done? Quite a lot, I guess. That seems like a long time ago and when they came by, I think, we’ve only been open for a couple of months. We haven’t grown much unlike the scene in London which kind of has exploded and gone crazy. Everybody is expanding. We’ve actually never expanded the brewery since we’ve opened. We’ve always been quite happy with where we are at. The brewery brewery is financially stable, enough to keep us happy but certainly not enough for mansions or benzes. But then again those things aren’t really anyone’s focus here. We all have a relaxed lifestyle, get to make the beers that we want. 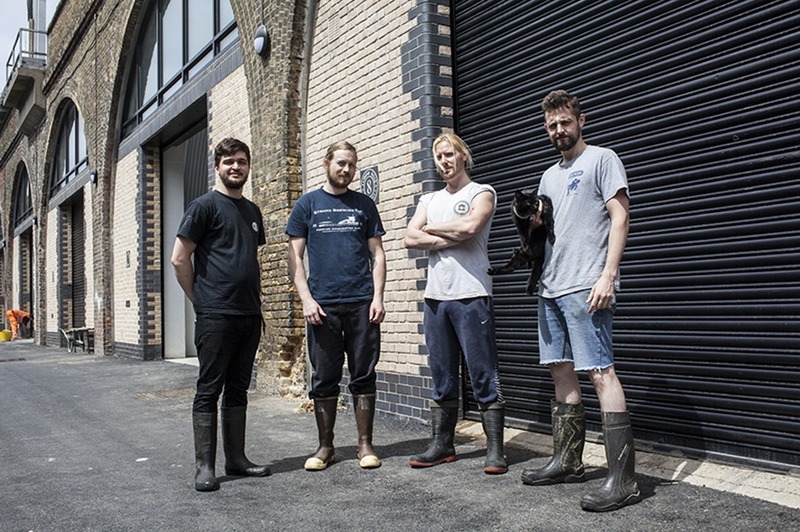 We’ve obviously done a lot of interesting projects along the way, like we did a beer with Mikkel, we’ve done one recently with Prairie Artisan Ales, we’ve got to chat chat with the guys at Girardin who then allowed us to use their beer to blend with ours. At the moment we are going through a little bit of growth. We’ve just recently taken on a 15 barrel fermenter. Beavertown lent us a 12 barrel fermenter. And a new 15 barrel kettle and hot liquor tank will arrive next week, actually. We’re getting just a little bit squashed about now to supply all customers, so it’ll be nice to have a little extra capacity. Just so we have a little bit more room for doing extra brews and being a bit more playful. I’m also expecting a baby boy in December which is incredibly exciting. But I feel we need to be a little bigger to make sure the brewery can support my new arrival too. But you’re still using The Kernel equipment? Yes, exactly. We still have the same equipment we’ve had when we began. We still have the original fermenter, just a couple of additional ones as well. I like the story of how you got the equipment from The Kernel and how Brew By Numbers got theirs from BrewDog. I wonder as you’re going to grow further, if you’ll eventually pass the kit along to another emerging brewery. That would be quite nice, yeah. If an opportunity arises and that feels right, then yes. We’ve been looking at brewing equipment online and we noticed that there’s a lot of equipment the same size as ours, five barrels, that is for sale. It seems the industry is awash with this size brewing equipment. That means there’s either lots of breweries that were launched recently that have not done so well at that size or there’s been a lot of breweries that have done well and are moving along to something a little bit bigger. So if we were to try to sell it, I don’t think we’d get a lot of money for it. But the idea of carrying on the tradition is very appealing. And something I’d like to do if we’d find the right person. It feels like that’d be a really good thing to do. Being from Leeds, how did you end up in London? I’ve been in London for eight or nine years now. I did not move down to start the brewery, but to be a chef. Usually if you’ve been at a restaurant for longer than a year you’d be hinting at you wanting to be the sous-chef or wanting to take on the head-chef position. Because usually by the end of a year, you’d assume you’d learnt everything in the kitchen and it was time to move up or move on and learn new things somewhere else, which is kind of an industry standard. Thus I bounced around and eventually worked at most of the restaurants I wanted to work at in the North. Obviously the restaurant scene in London is very exciting, so I moved down to work in restaurants here. Then a lucky happening came along and I ended up meeting Andy from Redemption Brewing. I worked there for three years. Hey paid for my tuition at the IBD [Institute of Brewing and Distilling], was a great mentor and helped me start this place as well. Now you are in Bermondsey and you’re sharing a bar at the LBCF with fellow Bermondsey brewery Brew By Numbers? It’s a tradition now, as we’ve done it for the last two years. Do you guys in Bermondsey ever socially meet besides when you help each other out with ingredients or equipment? We meet quite regularly. We’ve had a leaving party last Friday, for a brewer that’s been with us for a year now and who unfortunately had to move back to Barcelona for visa issues. So we had a barbeque at ours, played some music in the street, had a few beers. The guys from BBNo, quite a few from The Kernel came over, some guys from Five Points and we’ve had a few guys from Siren down. It is a really nice industry in London. We sort of meet reasonably regularly. Not always talking about business. But I guess eventually after three or four beers it does always wind up talking about business. In your interview you’ve also mentioned that in the beginning you brewed beers you couldn’t find to buy. Nowadays it’s probably more difficult to find a beer that nobody else brews. How has that changed your brewing? That is true, actually, in a sense. There are still lots of things out there however. For example, there’s the Journal by the The Brewery History Society. In there we’ve found a really interesting beer brewed in the 19th century at Cambridge University. It was brewed once every ten years, and they’ve used to age the beer for ten years as well. It was a fourteen percent beer. In the beginning it obviously was very sweet but they used to attenuate it all the way down to zero sugar, so it was really light and delicate. The alcohol was probably hidden quite well. So it was probably closest to a sparkling English barley wine you can get. The article had a big break down of how the beer was made, what the final numbers were on it, like the final gravity, the colour, lots of information that you wouldn’t normally get of current beers. So there’s a lot of things hidden in history, like this Huff, that we’ve got to brew. Furthermore, you might not agree with somebody’s interpretation of a beer style or you want to skim the interpretation a little bit to make it your own; like our Saison. I guess the story goes that they don’t use a whole lot of hops in the beer. The beer was essentially brewed cheap so they train the yeast to eat the bulk of the sugar to leave a very dry beer and to get the maximum of alcohol out of the barley that was used. Hops being a very expensive ingredient, they didn’t use a lot of it. Instead they were using spices or herbs. But I guess in Flanders at the time, lemongrass was probably not one of their herbs or spices. And now we make a lemongrass Saison fairly regularly. So it is definitely about looking around in history and what is happening now. We like to check new beers out. But most of the time it is about what we’d like to do with a beer. Therefore I taste a beer and get an idea of doing something to it at a certain stage. And adding lemongrass to a Saison seemed like a natural thing. When you think of the production of beer, what do you think about most? Fermentation is always the most important thing, I think. The actual cooking of a beer has very little impact, apart from if you’re adding extra things. Then there are small things here and there where you can have an influence. And that’s obviously the most interesting part about brewing, the process. But in comparison to yeast, all the ingredients are somewhat sidelined, I guess. What part does the chef in you play when brewing beer? It is just about what makes sense. There are certain things you want to balance. In the kitchen we were always taught that whatever the dish was it had to be an interesting combination of colour, texture and flavours. As long as you can meet these three rather simple criteria, you’re always going to get a fairly good dish. So texture is something in beer that we look towards. Flavour, colour and balance as well. Just like when you’re eating any food, you want the balance to be right: Is the bitterness balanced with the sweetness? Or are we balancing the sweetness with some acidity? What flavours are going to lend themselves towards that? It’s similar to classic pairings in food. So it is always nice to see what exists in the beer already and then what can come along to match with it in a different version. Considering fermentation: There’s a guy playing Wu-Tang to a barrel of fermenting beer. You mentioned that you like to listen to music when you brew. Ever noticed any particular music preference of your yeast? We have not really recorded anything specifically one way or the other. We’ve had occasional unusual fermentation. But we’ve not recorded the music that was playing during that time. But to be completely scientific about it, I am not entirely sure what difference music could have made. Maybe that’s a project for the future. 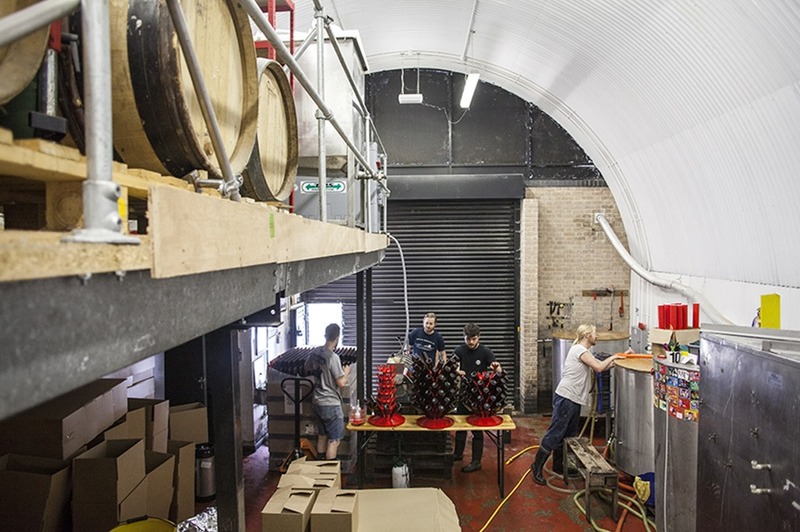 At one point during the process of opening the brewery did you start thinking about labels? We’ve really been lucky with Alec. We’ve been good friends for quite a long time. Upon starting the brewery, I sat down with him to just give him some guidance on what I wanted. My original idea for the label was totally different to what we have now. It would be something a lot more design led, without illustrations, but something more classic with a nice font, simple lettering and then let the beer speak for itself. Which I think a lot of people have done really successfully. Alec was on a sabbatical from his job as an art director at a big company, where he’s been doing rice packaging and toilet paper packaging. Maybe he wasn’t enjoying doing my brief. We were going back and forth and he was never happy and I was never blown away, until eventually one of us made the suggestion to maybe just put an illustration on there. He did that and we’ve both liked the illustration. Since then there’s been this nice natural growth. Our beers change reasonably often, like the Pale Ale almost always uses the same base recipe, but we do tweak that a little bit as well. However, the hops change quite often. So we change the labels all the time, like the Pale Ale label is never the same. Also with every batch of the Saison the label changes. So we’ve got lots of labels and if you look on the website, there’s an Instagram gallery. Which beer do you brew the most of? The Pale Ale, by far. Maybe 60 percent of sales is the Pale Ale and we do seven core beers. But it’s also the beer we tweak the most. So basically if I buy two Pale Ales of different batches, it’s never going to be the same beer twice? Will that ever change? Will you eventually settle on a recipe? For the moment, I would hope not. But I can never guarantee what’s going to happen tomorrow. This actually came out of a conversation with Evin [O’Riordain, founder of The Kernel] at one of these get-togethers we talked about before. He asked me the question: do you wake up the same person tomorrow? And actually maybe you don’t. Maybe you wake up a slightly different person every day. And the way you work with things are different day to day, because you change and grow and so the next day you become a slightly different person. Maybe only by a very small amount. But over time your viewpoint can change from one thing to another. And also beer just changes naturally anyway. One of the most interesting things is to actually engage with the beer properly; not just drinking it because you’ve got it in your hand. “Partizan Pale Ale is good”. I hear this all the time. It’s just so enforced in people’s perception that it’d be the same beer over and over. At one point you are just drinking the beer without mentally tasting the beer or engaging with it properly. But when you’re told that something is going to be different every time, you are a little more intrigued and it sparks your interest. It makes the whole experience much more worthwhile, I think. Some people engage with beer to then rate them. In the same interview you mentioned that you are reading what people write about the beer. Do you still do that? Not a great deal. RateBeer is a funny one. I wouldn’t go on there and read the words. We have quite a few guys who come down at the weekends and I always go up to them and ask them what they think, because I know them personally. I think one of the issues with RateBeer or TripAdvisor or any of those online reviewing things is that reviewing things is really personal. If you know one of those reviewers, it’ll make sense to you because you can relate to their viewpoint. Which is again why I talk to the guys, I know they’ve drunk a lot of beer, they are really interested and they can give a lot of interesting points in a discussion about beer. But if I don’t know the person, then it is sort of a worthless commentary for me, because it doesn’t have any context to it. We begin with a question we ask everybody and end our interviews with a question we ask everybody: 5 beers you’d recommend people to drink at some point before they die. Orval has got to be number one. Actually, maybe just having five different Orval. Just drink Orval at least five times [laughs]. It’s like the thing we’ve talked about before: It is just one beer and the process is exactly the same. It is one of the tightest breweries in Europe, if not the world, with the equipment and experience. But they are just making one beer over and over again. But it changes: After six months and second fermentation different things start occurring. It’d be one of the most exciting things to try five different Orval, one that’s fresh off the line, one that’s six months old, etc. As for this question, which ties in with the first one: you need to kind of learn the person before you can direct them towards what you think they should have before they die. Which Partizan beer ages very well and would be interesting to drink at different ages? We’ve done a few, like the Barley Wine. 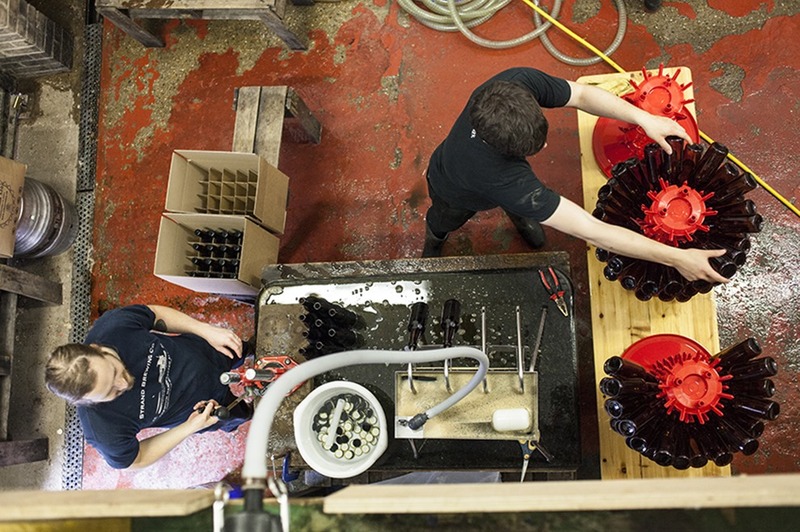 We release a Barley Wine every year and also age one in wood – this year it will be in a cognac barrel. Then the Huff that we brewed, which hasn’t yet been released. Once we feel we aged it long enough that one will also lay down fairly well, I would think. The Saisons, weirdly, even though they are only a 4 percent beer, age particularly well. We’ve found a few in an account that haven’t moved that quickly as they should do, and who were a year to two years old. And they age really gracefully. What yeast did you brew it with? The 3711, I think it’s Wyeast, the French Saison. We also blended our Saison with Girardin Lambic to make a cuvee. We’ve been aging that for two years now. It’s just starting to turn a bit ropey, so we might have to take it off sales. Then we’ll let the ropiness set and get a new beer out of that one.